Out of his own pain, Cec has willingly shared the myriad emotions he experienced in his own trials, even as he offers us hope for healing and comfort in the process. 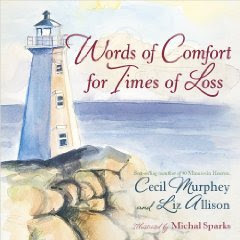 This lovely gift book, Words of Comfort for Times of Loss by Cecil Murphey and Liz Allison, is one of the best investments you’ll ever make. Buy one for yourself, but also buy a couple of extras to keep on hand for a future time when someone you know experiences a loss and needs a little comfort.